*Look for a version of this story to be published in an upcoming issue of Bear Hunting Magazine! I always am mesmerized by the pads of a predator and take the time to study them…almost like some sort of Palm Reader would analyze someone’s “life line”. I can’t help but wonder what trails have been trod and how many miles had been laid down in this bear’s 15-20 estimated years. A quick note on field judging bears, based on the size of their pads: measure across the pad and then add one inch to equal what the bear would square. 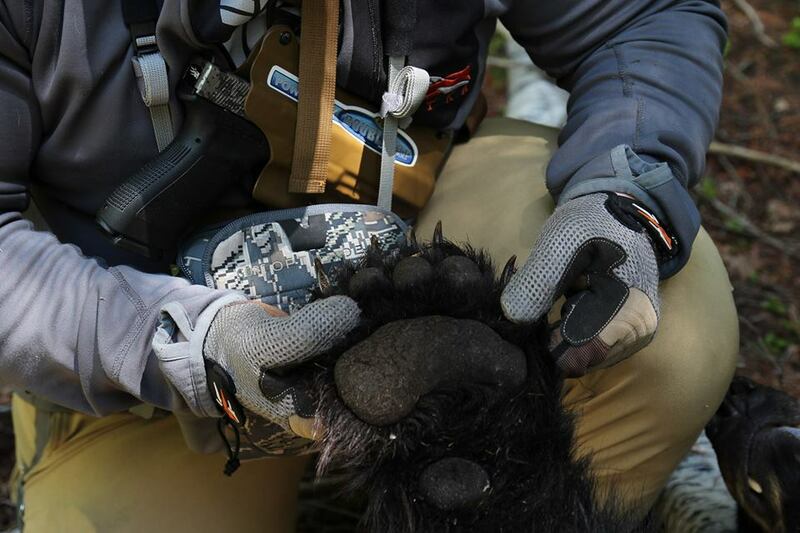 This bear’s pads almost measured six inches across, which jived perfectly…as the bear squared over six feet. There is a saying that “every dog will have his day” and this most certainly applies to hunting. If you spend enough time in the woods, you are bound to experience an “epic” encounter at some point. A few weeks back, my number was apparently up to be thrown a bone and I was to experience one of these “epic encounters”.